Are you struggling with physical or emotional pain, or with spiritual disconnect? Come see me for Chakra balancing, Reiki (energy healing) or Foot Reflexology full of love and light. If you’re looking for high quality and personal service, you have come to the right place. At Kimberly Freeman Alternative Healings I will give you and/or your pet the attention and personal service you’ll come to expect and enjoy. I offer a calm, soothing relaxation session in Energy Healings using the ancient Japanese method of Reiki. Let me help you and your pet heal your emotions, mind, body and spirit. I offer Foot Reflexology working specific pressure points on the foot that are connected to the organs, bones and nerves within the body. I am offering appointments in Ione on Wednesday, Thursday, Friday, and Saturday, from 9am - 2pm. Please call or text for an appointment to 916-837-3235. I can also come to you in Valley Springs, Plymouth, Sutter Creek, Jackson, Pine Grove, Pioneer, Galt, Elk Grove, Sacramento, Roseville, or El Dorado Hills, if you have a quiet space for me to set up. I also do "Love Me" splurge days. 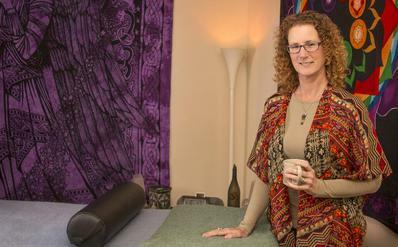 If you have a group of friends and want me to come and set up sacred space to received Reiki and/or Foot Reflexology, we can set that up as well. I would just need to know the number of participants. I am offering Reiki for Canine, Feline and Equine as well at the pets home. Call for an appointment. Also offering distance healing. Distance healing can be done over the phone or during a predesignated time during a meditative state. Reiki I, II and III level classes offered. Class fee is $150 ea, must register via e-mail kimberly@kimberlyfreemanhealings.com or call/text 916-837-3235, at least 2 week prior. Please contact me for a class schedule. 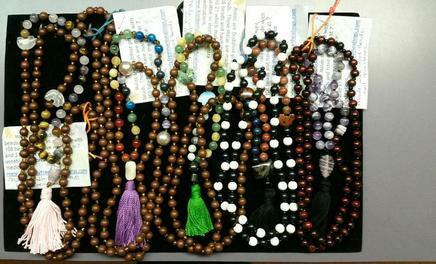 Mala Beads are Buddhist Prayer Beads. They are made of wood beads and Gemstones and each one is unique. There is a series of 7, 80, 21 beads to equal 108 beads. 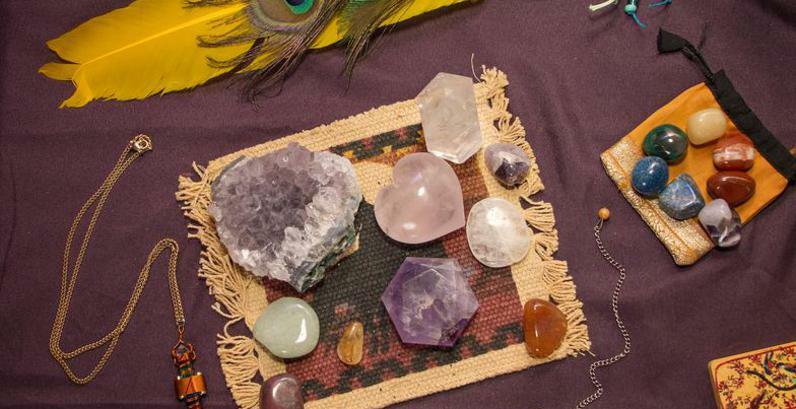 The 7 & 21 are gemstones used for healing and the 80 are wood beads to help with grounding. At the end of the 7 & 21 is a marker bead to let you know that you have completed that section. They were created for the typical citizen like you and I who do not live in a Buddhist Monastery and who may have time constraints due the the chaos of life. The Buddhist hope is that people pray as often as possible so they created these to give to the town folk so that they can use them to reach enlightenment. The theory is that if we are very short on time then we can use the side with 7 beads. If we have a little more time we can use the side with 21 beads. If we have enough time, then we can do all 108. The goal is to do the 108 as often as possible. They are to be used during meditation to help the physical body stay focused by holding the beads between the thumb and the forefinger and inching them forward after each mantra/prayer is expressed; and to help the mental mind by mentally repeating mantras for each bead. You may contact me directly at 916-837-3235.